Culture-based initiatives can help preserve the identity of old cities undergoing urban renewal. Photo credit: KRIHS. Since the early 2000s, local governments in the Republic of Korea have implemented urban policies to improve city competitiveness and revive declining inner cities. Since the enactment of the Special Act for Promotion and Support of Urban Regeneration (Urban Regeneration Act) in June 2013, central government-led urban regeneration efforts have been carried out in declining neighborhoods. Analysis of three indicators (population, industry, and structures) showed signs of decline (in two or more indicators) for 2,262 or 65% of the country’s 3,479 neighborhoods, towns, and townships (as of December 2014). Since taking office in May 2017, the administration of Republic of Korea President Moon Jae-in has announced a “New Deal” urban regeneration program, involving public spending of 50 trillion won (more than US$44 billion) over a five-year period. The government plans to carry out 500 projects in more than 100 regions to revive old inner cities and decaying residential areas. This policy brief is adapted from an article entitled “Urban Regeneration and Gentrification,” published in the Space and Environment magazine of the Korea Research Institute for Human Settlements (KRIHS). In the Republic of Korea, urban regeneration efforts focus on boosting the competitiveness of a city to establish or revive its economic base. Public investment in certain regions through urban renewal projects, however, gives rise to the phenomenon of gentrification (Hamnett, 2003). Urban regeneration can result in “social cleansing,” or the displacement of specific populations (Lees et al., 2015). Rising land prices and rents in gentrifying neighborhoods and surrounding areas force out existing residents. This consequence has been cited as the biggest problem with urban regeneration. Poorly managed urban renewal projects that are imposed from the outside without establishing themselves effectively within the region serve only to accelerate gentrification (Shin, 2016). In pursuing different policies and projects, there is an inevitable restructuring of the urban space (i.e., eviction of existing residents) as they bring about the mobilization of other forms of policy intervention and capital investment. The costs and benefits of gentrification may vary according to what is important to stakeholders (Lang, 1982). Its effects may be positive when viewed chiefly from the standpoint of policymakers and real estate owners. Local governments tend to emphasize the positive aspects of social mixing across class lines with the revival of declining neighborhoods and rising real estate values increasing tax revenues and promoting local development. In contrast, rising rents lead to involuntary displacement of existing residents. The lack of affordable housing may result in problems for the community. It can give rise to migration and conflict among residents, building vacancies, and homelessness among low-income residents. Real estate values may rise unreasonably due to effects from adjacent neighborhoods, while housing demand in nearby communities may increase with the relocation of residents from gentrified areas. Moreover, the infusion of massive amounts of capital into neighborhoods results in a loss of cultural diversity and in uniformity of streetscapes and business types. Jung District is Daegu’s old inner city. It is similar to other cities that have fallen into decline because of a combination of urban decay and the suburbanization of central functions. Since 2007, Jung District has been the focus of state support through a public design initiative, street projects, and a culture-based revitalization of traditional markets. The local government’s ongoing efforts have been regarded as a successful example of urban regeneration, with visitors to Jung District increasing to about 1.1 million in 2015 from around 300 in 2008. Multiple studies have cited an increase in cafés and Western-style restaurants as an indicator of the district’s gentrification (Freeman & Braconi, 2004). A study of 20 types of business in the area showed the addition of seven cafés and five Korean restaurants and the loss of two clothing and 15 grocery stores. The study observes that the decrease in the number of grocery stores coincides with the initial increase in cafés and Korean restaurants since 2012. The area was also home to a hardware store, a beauty salon, and a laundry shop, but these closed down between 2011 and 2012. 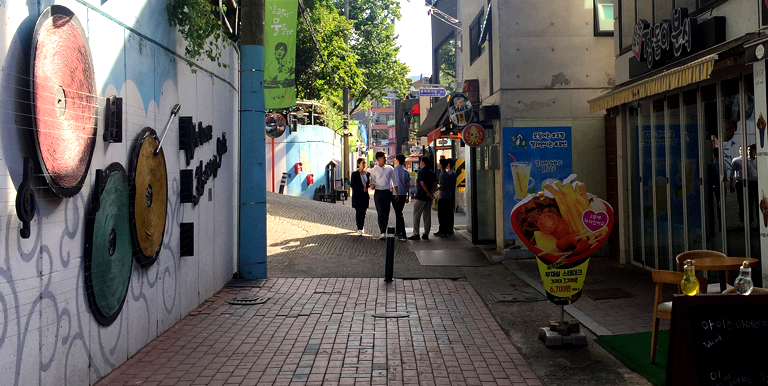 This decline ins businesses may be seen as also coinciding with the rise in rents for detached and multiplex housing in the Daebong-dong neighborhood and the transformation of a street into Kim Gwangseok-ro Mural Road, designed to honor a popular folk singer. Excessive commercialization was also found to have resulted in decreased benefits for residents. Commercialization of residential areas has led to issues of vulnerable population outflows, weakened residential functions, and community breakdown in gentrified neighborhoods, with increases in businesses and a decline in registered resident populations. The precedence of ordinary business types over amenities in existing neighborhoods leads to a loss of essential conveniences for residents, while the increase in commercial sites for visitors exposes residents to inconveniences, such as noise, congestion, and invasion of privacy. Zukin (2012) observed the homogenization and loss of distinctive neighborhood identity as a result of the high-end transformation and redevelopment of public places, noting that one experiences similar environments wherever one goes. Source: Author, based on data from Statistics Korea. From an urban regeneration perspective, gentrification may serve its function in reviving a city, allowing declining neighborhoods and those requiring redevelopment to follow the natural path of development. While the target of urban regeneration pilot zones has been the establishment and revival of economic bases in deteriorating neighborhoods through public spending, some side effects of gentrification may occur in the process. In the absence of concurrent measures to address their side effects, ongoing urban regeneration efforts may result in worsening geographic polarization and spatial inequality for neglected populations. At the same time, premature state policies to address private capital inflows or to control rents may ultimately prove harmful, as they can impede innovation, harm diversity, and inhibit revitalization of the region. Rather than simply seeking to avoid gentrification in urban regeneration, policies should be designed to mitigate and prevent negative side effects. Plans to address the biggest issues, namely the involuntary relocation of residents and community breakdown, should also be considered at the time of urban regeneration policy implementation. Developing countries are very likely to pursue state-driven development in the future, with urban regeneration used as the chief state policy in addressing decaying urban environments. Urban regeneration efforts must take into consideration an important question: For whom is the city being created? Another area requiring attention is that cities may be exploited as investment sites for economic gain. Perhaps the most important concern is establishing a societal consensus toward the transformation of cities into living spaces where different income segments and values coexist. Korea Research Institute for Human Settlements (KRIHS). 2017. Urban Regeneration and Gentrification. Space and Environment. Vol. 72, pp. 11–14. December. Her research areas focus on urban regeneration, urban policy, land use, and gentrification. She obtained her master’s in Urban Planning and finished Ph.D. coursework in Urban Planning from the Seoul National University. She has been working as an expert advisor of the Central Urban Plan Committee, Ministry of Land, Infrastructure and Transport since January 2018.